Cameron Sapp holds an osprey before release. Photo: James Woodcock/ Billings Gazette. This project will use blood samples drawn from osprey nestlings to gather baseline data on contaminant levels in and along the Yellowstone River. Osprey (Pandion haliaetus) are considered a sentinel species based on their chemical sensitivity, position in the biotic community, exposure potential, and geographic distribution and abundance. Osprey are also potentially useful as contaminant level indicators for aquatic -- while the adults are migratory, their eggs and nestlings reflect local conditions. With such a great abundance of industry along the Yellowstone River, including several refineries and a coal-fired power plant, it is important to understand the magnitude of contaminants entering the system. Along with heavy industry, agriculture and livestock operations may also play a large role in altering the system. The key objectives of this project include community involvement through the use of citizen scientists, examining fledgling success rates over space and time, examining contaminant levels above and below sites of heavy industry, and working with researchers in Missoula, MT to conduct a comparative analysis of statewide mercury levels. The project is also supported by grants from the following agencies: Toyota Together Green National Audubon Society Grant program; Montana Audubon Society; Yellowstone Valley Audubon Society. *** UPDATE 7/25/12 --> Click here and here to view two Billings Gazette articles on this project! *** Read Cameron Sapp's Osprey Blog (Click here)! Pryor Creek is a classic prairie stream and a tributary of the Yellowstone River near Huntley, Montana, which has been fragmented by two man-made structures: the Huntley Canal and the Siewert Irrigation Diversion Dam. For nearly 100 years, these structures impeded fish passage but a newly constructed irrigation siphon under the creek now provides unimpeded passage for catfish and other species from the Yellowstone River. This allows access for spawning, seasonal shelter, or foraging, thus increasing the productivity for many species in the Yellowstone River. This change provides an important opportunity to gather data on fish passage that will be useful for managers on many other barrier related projects in the Yellowstone River system. Methods for this study include electro-fishing and trammel netting on the Yellowstone River, near the mouth of Pryor Creek, in order to capture as many fish of various sizes and species as possible and tag them using external fin markings and PIT (Passive Integrated Transponder) tags. In the following months, fish will be recaptured and tagged to follow any movement of fish from the Yellowstone River into Pryor Creek. Furthermore, a previous study on species diversity in Pryor Creek by Montana Fish Wildlife and Parks will be replicated in order to compare site specific data from pre- and post- barrier removal. Data collected on species abundance and diversity will be analyzed and tested for significance. *** UPDATE 7/31/12 --> Click here to view a Billings Gazette article on this project! Robert (Bo) Walker in the Beartooth Mountains. My research will examine the impact of fish stocking montane lakes on local amphibian populations. The introduction of fish into aquatic systems that are traditionally fishless has been shown to greatly impact the diversity and abundance of native amphibian populations. Fish presence can lead to direct predation on small adults and amphibian larva, competition between fish and amphibians for food sources, and a reduction in amphibian reproduction and larval activity. Therefore, it is important monitor bodies of water where nonnative fish are stocked, in order to ensure the continued existence of already declining amphibian species. My study area consists of the montane lakes of the Absoroka-Beartooth Wilderness in south-central Montana. I will backpack into both lakes with a recorded fish presence and lakes without fish and conduct amphibian and fish surveys. The data collected through these surveys will then be examined in order to findwhat habitat characteristics make lakes most suitable for montane amphibian breeding as well as better understand the impact of fish stocking on amphibian populations. A secondary goal of this study is to collect baseline data on these understudied, high elevation amphibian populations. This data will help guide future land management decisions in the face of climate change. Warmer, longer snow-free seasons and snowier, but less cold winters could lead to interesting changes in the distributions and abundances of montane species. Understanding what amphibians are where and in what numbers now, will help land managers better understand how climate change has impacted such species at a later point in time. *** UPDATE! - Click here to read a 10/29/2012 Missoulian Article about Bo Walker's research and his "Huck Finn existence" during field work. ***UPDATE! 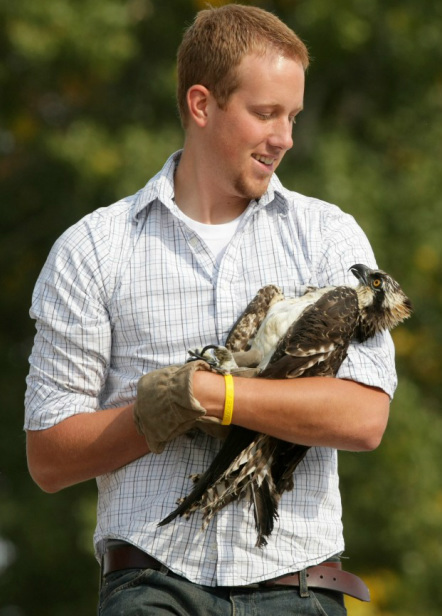 - Click here to learn more about Bo Walker's talk on his research (10/23/12, 7-8pm, Montana Audubon Conservation Education Center . My project is part of an international collaborative research project between Rocky Mountain College, Stanford University, North Carolina State University, Lehigh University, Carnegie Institution for Science, and the Mongolian University of Science and Technology. The related research will be the foundation for my undergraduate senior thesis concerning the development of a geologic and paleoclimatic historical record of regional uplift of the Hangay Dome and Altai Mountains in Mongolia. Understanding the age and evolution of regional mountain uplift, landscape morphology, and resulting mass transfer processes is critical to developing a comprehensive model of global tectonic uplifts. The regional uplift of Hangay Dome and Altai Mountains provides a modern analog for uplift processes viewed in orogenic belts around the world. The regional Mongolian uplift provides an ideal environment for geodynamic research that will help facilitate the development of a more concise hypothesis concerning processes of regional uplift and mass transfer. 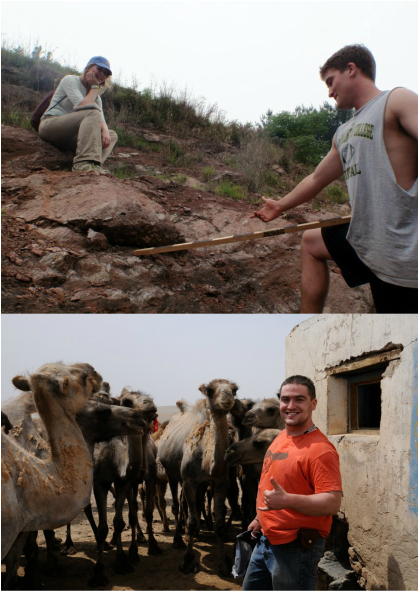 My research will be focused on sample collection for isotopic and provenance analysis, establishing an accurate geologic framework for the study sites, determining atmospheric circulation patterns of western Mongolia, and performing petrographic provenance analysis on sandstones sampled from study sites. My proposed research project also requires using isotopic data in an attempt to construct a history of successive periods of uplift and subsequent sedimentary basin formation in Mongolia. d18O and dD values found in modern rain and surface waters will be compared to prehistoric d18O and dD values preserved in calcitic sediments found in sedimentary sequences sampled from the research sites in Mongolia. *** UPDATE! - Click here to learn more about Jobe's project. Zach Farrand (left) and Eastern Racer on 5 Mile Creek, near Billings, MT. The Yellowstone River is the longest free flowing river of the lower 48 states. It has three main habitats: forest, shrubland, and grassland. It also has a significant elevation gradient of 5,978 feet. Riparian corridors are important to bats for roosting, foraging, and possibly migration corridors. In order to help fill in the information gaps of bat distribution in riparian corridors, especially in eastern Montana prairies, I will use acoustic monitoring equipment to survey bat activity at six different public fishing access sites along the Yellowstone River. These sites will be distributed from the Wyoming to North Dakota borders. The variety of vegetation and elevation gradient should allow for a rich number of species. Two Petterson acoustic detectors will be placed at each site and left to run from sunset until one or two AM. Results of monitoring will be analyzed each morning using Sonabat. Detectors will be placed in each habitat type to evenly represent all three habitat types along the Yellowstone River. I will visit each site twice, once in late-May and once in July. By doing this I hope to receive calls from migratory bats in May and resident bats in July. Resulting data will be used to determine species distribution along the Yellowstone River as a whole and within the three habitat types. We will compare results from each period in the summer to analyze migration and residential species habitat preferences. All data will be submitted to the Montana Natural Heritage Program at the end of the study. The data we collect will be used to design a larger scale survey examining habitat use and species distribution on the Yellowstone River.